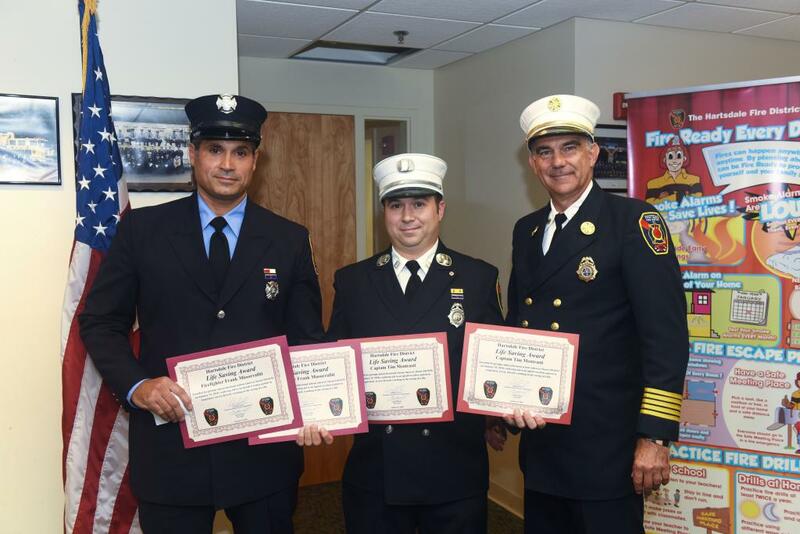 This year’s Annual Hartsdale Fire Department Awards ceremony once again highlighted the outstanding work and dedication shown by members of HFD. In two different situations members of the department demonstrated their professionalism and extensive training. The first involved an EMS call where they assisted in saving two lives and, in the second, provided continuous protection to the community despite a direct lighting strike to HFD Station 2 that crippled communications. 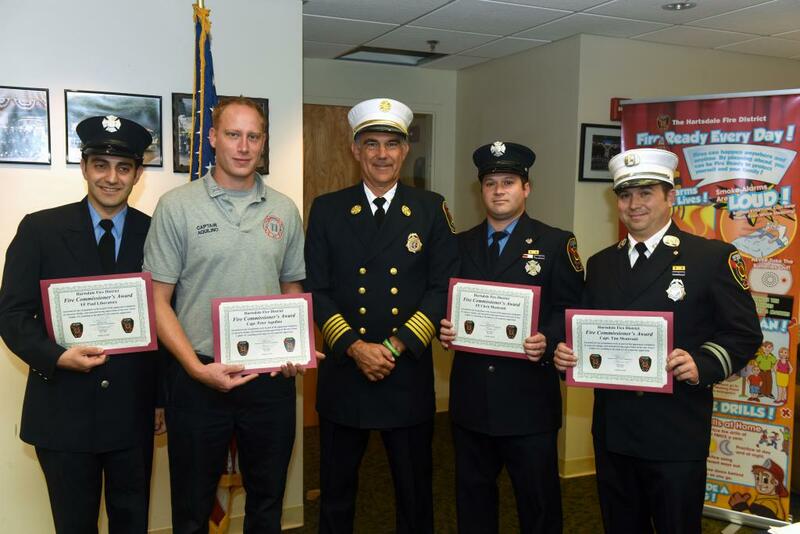 The two Life Saving Awards were presented to the crew of Engine 170, Captain Timothy Mentrasti and Firefighters Frank Lacalamita, Frank Musorrafiti and Frank Gray for their extraordinary efforts on January 19, 2018. After receiving a call from Greenburgh Police for CPR in progress at 319 North Central Avenue, Engine 170 arrived on the scene simultaneously with GPD and EMS units. Members from both agencies found a women down, unresponsive, and not breathing. The GPD paramedic determined it was an opioid overdose and Engine 170 members immediately opened an airway and provided rescue breathing via a Bag Valve Mask. GPD paramedics administered multiple rounds of Narcan. The patient was moved to the stretcher as HFD and GPD members cleared the way for transport to the ambulance as HFD members continued rescue breathing. Once in the ambulance, additional Narcan was administered and the patient began to breath on her own and regain consciousness. A sigh of relief felt by all the rescuers was short lived as questioning of the patient revealed that she had been with her husband who was in the car. As GPD continued patient care, HFD and GPD members initiated a search of the Michael’s parking lot where they found a male in a vehicle unresponsive and not breathing. Once again, after the paramedics determined it was an overdose, HFD members provided rescue breathing as GPD paramedics administered multiple rounds of Narcan. The male patient was moved to the ambulance with rescue breathing in place and, once inside the ambulance, after additional Narcan was administered, the male patient regained consciousness. The dedication of all responders allowed both patients to be transported to the hospital conscious and alert. 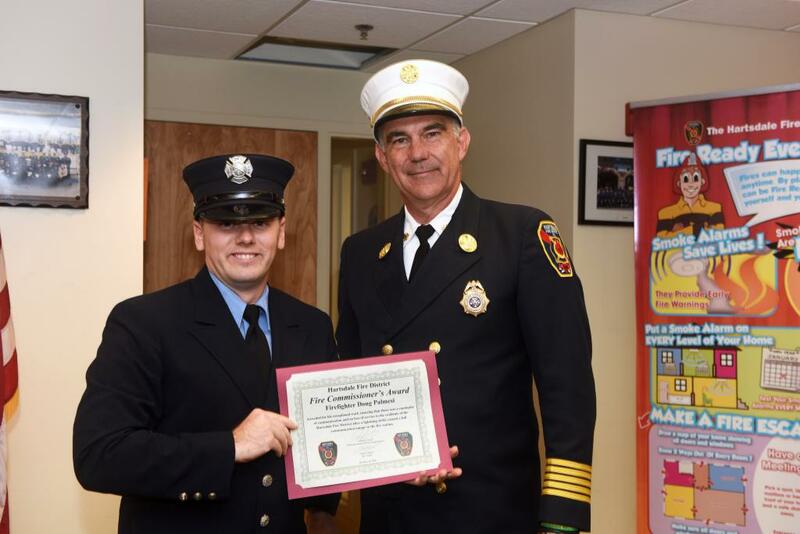 Firefighter Doug Palmesi was presented a Fire Commissioner’s Award for the actions he took, while working the Desk Watch, on July 17, 2018, when Station 2 took a direct lightening strike knocking out all communication systems. Using his personal cell phone for the more than the next seven hours, Firefighter Palmesi made continuous phone calls to Westchester County 60 Fire Control and communication vendors to devise a plan to receive emergency phone calls. His hard work ensured that HFD units were dispatched in a timely manner during a serious storm when the community truly needed the services of HFD. A Fire Commissioner’s Award was also presented to the Apparatus Committee “for their exceptional work…. in research, design, and manufacturing supervision of the new Tower Ladder 15, resulting in the delivery of a superior apparatus”. The committee was made up of Deputy Chief FJ Spinelli, Captains Timothy Mentrasti and Peter Aquilino along with Firefighters Frank Lacalamita, Erick Vandenberge, Paul Liberatore, and Chris Mentrasti. 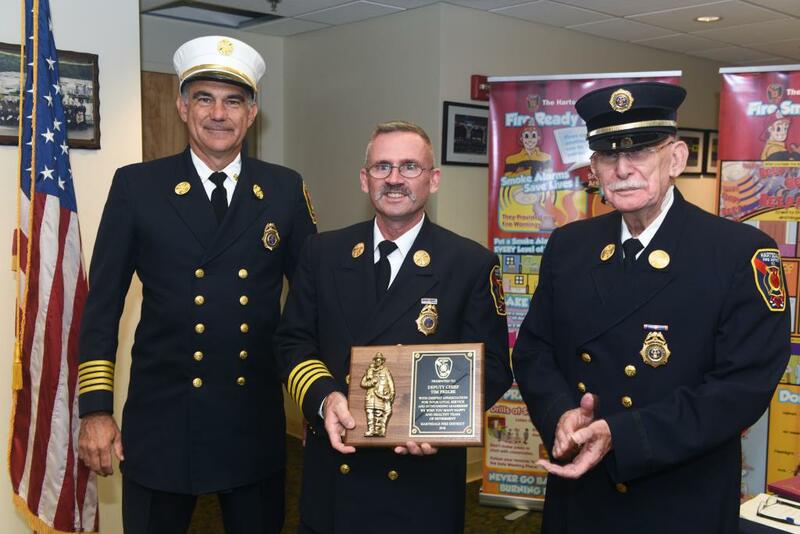 The final Fire Commissioner’s Award presented that night went to Volunteer Captain Rene Dupre for his work in preserving the history of the Hartsdale Fire Distrcit. Captain Dupre refinished and mounted an historical deck gun, bell and sign outside Station 2. 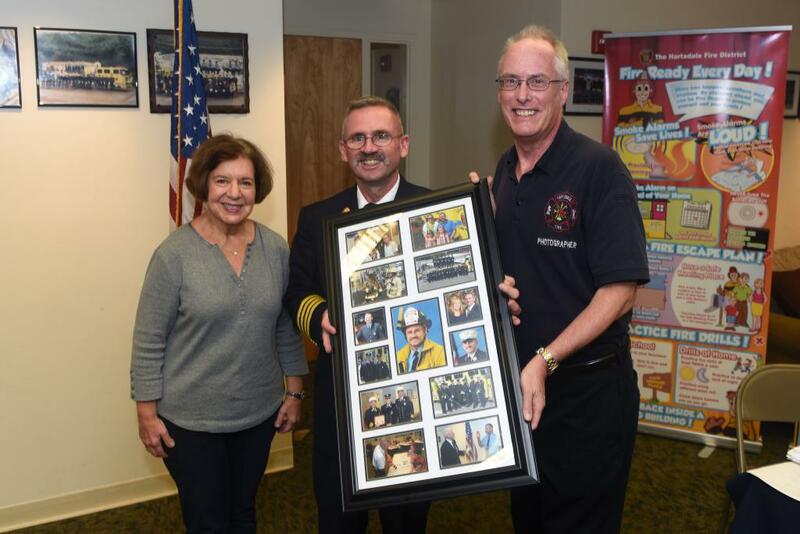 Also, during the awards ceremony, Deputy Chief Timothy Preble was presented his retirement plaque for his of service to the Hartsdale Fire District. He was also presented a photo montage, by the photo unit, depicting his time in the department. 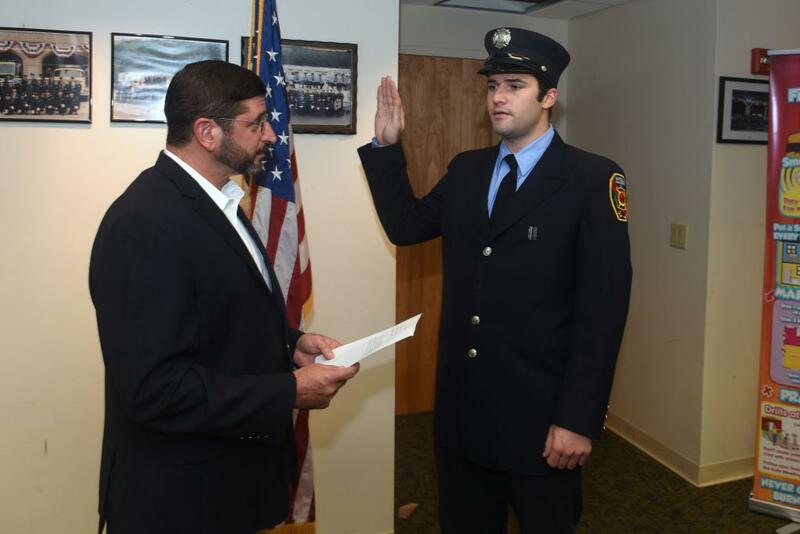 Prior to handing out the awards, Fire Commissioner Chairman, Anthony Frasca, swore in probationary Firefighter Matthew Servello to start the monthly Fire Commissioner’s meeting . Chief Ed Rush commented that this is his favorite night of the year because it’s when all the accomplishments, hard work, and dedication of the department members are recognized. Besides the awards handed out that night he also acknowledged all the members who did not take a sick day over the past year.